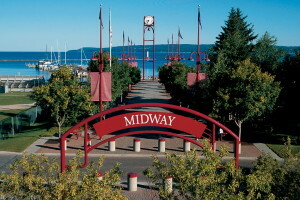 Take an afternoon stroll along Petoskey’s well manicured waterfront. Throughout Petoskey, Harbor Springs, Bay Harbor and near-by Charlevoix, visitors will find a land rich in history, culture, art, and entertainment. There’s also a great many options in the worlds of shopping and dining. Bay Inn of Petoskey is located just two miles from beautiful downtown Petoskey. The downtown area boasts an array of boutique shopping, a wide range of dining choices and of course a rich variety of cultural activities. Be sure to visit the famous Gaslight Shopping District, where you will find distinctive shopping opportunities such as Symons General Store, Bear Cub Outfitters, and Grandpa Shorter’s Gifts. The main street in Petoskey is Mitchell Street, running east and west throughout downtown. At the east end, visitors will find the public library as well as Crooked Tree Arts Center, a public gallery and studio also housing the Little Traverse Civic Theatre. Plan to take advantage of the Petoskey waterfront where you will enjoy a marina atmosphere as well as the old depot building, now home to the Little Traverse Area Historical Society. Petoskey also offers plenty to do out of doors. Experience the beautiful waterfront marina area for an evening stroll along the docks. Beach goers will take great advantage of the Petoskey State Park where they can frolic on Lake Michigan’s sand bars and play amongst the rolling dunes lining the shore. For additional information on things to do in downtown Petoskey, please visit www.petoskey.com or www.petoskeydowntown.com. Located just ½ mile from Bay Inn of Petoskey, the village of Bay Harbor was developed in the 1990’s as an upscale marina and golf resort community. Visitors will enjoy a well-manicured shopping district featuring upscale retail stores and unique dining experiences. While visiting, take a stroll along the waterfront and enjoy an afternoon cocktail at the local watering hole, Knot Just A Bar. The Bay Harbor Marina provides docking and gas services. Bay Harbor is situated between two public recreation areas, East Park and West Park. Both parks offer picnicking areas with excellent lake views, as well as access to the Little Traverse Wheelway waterfront bike path. Located just fifteen miles south of the inn lays the vibrant resort town of Charlevoix, nestled along the Pine River Channel, an inlet leading between Lake Charlevoix and Lake Michigan. Visitors can enjoy a park and walk atmosphere where cultural festivals and art fairs frequent the sprawling waterfront. A trip to Charlevoix should be sure to visit the famous Earl Young homes, preserving the famous architect’s designs and developments. Charlevoix is also noted for the US Coast Guard Life Boat Station, The Charlevoix Lighthouse, the Charlevoix History Museum and the Railroad Depot Museum. For help in planning your visit to Charlevoix, please visit www.charlevoix.org.